BEIJING, Dec. 29 (Xinhua) -- A New Year gathering was held by the National Committee of the Chinese People's Political Consultative Conference (CPPCC) on Saturday morning in Beijing. 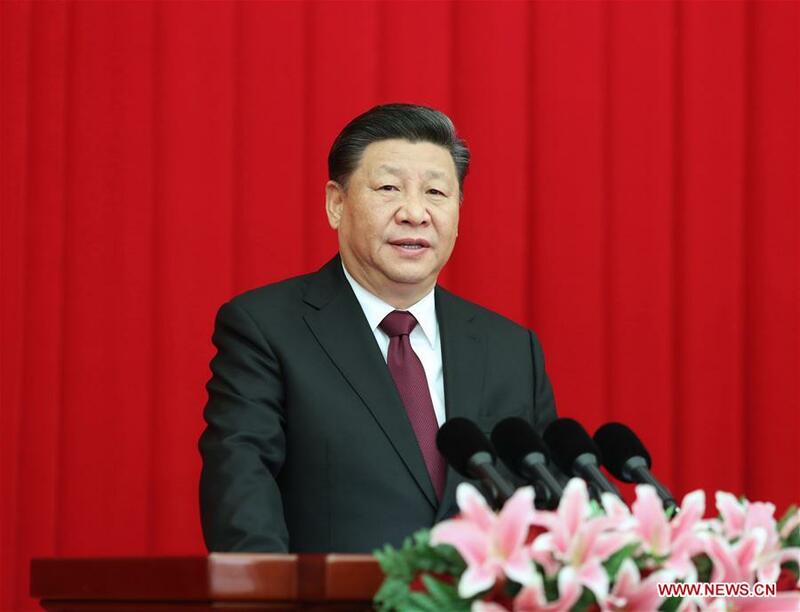 President Xi Jinping, also general secretary of the Communist Party of China (CPC) Central Committee and chairman of the Central Military Commission, delivered an important speech at the gathering. Senior leaders Li Keqiang, Li Zhanshu, Wang Yang, Wang Huning, Zhao Leji, Han Zheng and Wang Qishan attended the gathering along with senior members of non-communist parties, leaders of All-China Federation of Industry and Commerce, representatives of personages without party affiliation, leading officials of central departments, members of different ethnic groups and people from all walks of life. The year 2019, which marks the 70th anniversary of the founding of the People's Republic of China, is a key year for securing a decisive victory in building a moderately prosperous society in all respects, Xi said. Stressing the importance of study, innovation and solidarity, Xi demanded efforts to both grab opportunities in development and deal with the challenges, as well as inspire Party members and people of ethnic groups in the country to keep fighting for new achievements. Xi recognized major progresses achieved by Chinese people under the leadership of the CPC Central Committee in the year 2018, adding that people had enjoyed a stronger sense of fulfillment, happiness, and security. In the year that marked the 40th anniversary of the reform and opening-up, the best celebration for the occasion was to advance the reforms and raise the level of opening-up, he said. "A total of 1,932 reform schemes have been carried out since the third plenary session of the 18th CPC Central Committee [in November 2013]," he said. "We showed our resolve to carry through the cause of reform and opening-up in the new era." For the year of 2019, Xi spoke of the need to pursue supply-side structural reform as the main task, take tough steps to forestall and defuse major risks, carry out targeted poverty alleviation, prevent and control pollution, and promote sustained and sound economic development. Xi pledged efforts to support Hong Kong and Macao in integrating their own development into the overall development of the country and maintain their lasting prosperity and stability. He also vowed to work for the peaceful development of cross-Strait relations and called for efforts to build a community with a shared future for humanity. Xi added that in the new year, the CPPCC should shoulder its responsibility to implement what is required by the CPC Central Committee and pool the wisdom and strength of Chinese people inside and outside the country for the realization of the Chinese Dream of national rejuvenation. The New Year gathering was presided over by Wang Yang, a member of the Standing Committee of the Political Bureau of the CPC Central Committee and chairman of the CPPCC National Committee. Wan Gang, chairman of the Zhigong Party Central Committee, made remarks at the gathering on behalf of the central committees of non-CPC parties, All-China Federation of Industry and Commerce and personages without party affiliation.